With a stay at Ameritania at Times Square, you'll be centrally located in New York, steps from Ed Sullivan Theater and Studio 54. 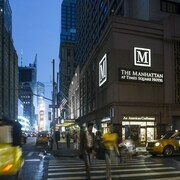 This boutique hotel is close to Rockefeller Center and Broadway. 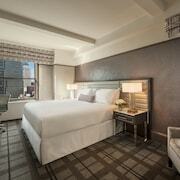 Make yourself at home in one of the 219 air-conditioned rooms featuring iPod docking stations. Wireless Internet access (surcharge) keeps you connected, and cable programming is available for your entertainment. Private bathrooms with showers feature complimentary toiletries and hair dryers. Conveniences include safes and desks, and housekeeping is provided daily.